Rachel and I received NRS Ninja PFDs as a wedding gift when we got married last September. That fall and winter the Pacific Northwest set all sorts of records for the coldest month, the wettest month, and the most rainfall. 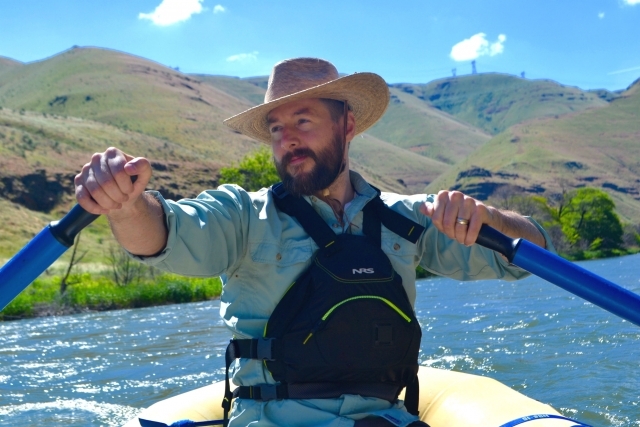 I had made the foolhardy promise to raft every month of the year, so I often found myself on the last Sunday loading up to paddle a swollen river in a cold rainstorm. During those winter trips, I wore the Ninja without fail. 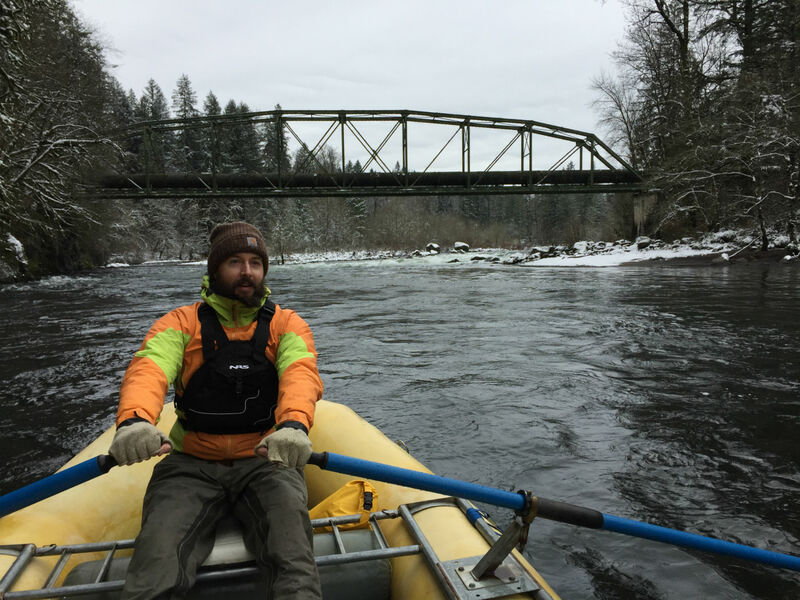 The double-paneled front kept my core warm, and my ungloved hands found a semi-permanent home between the panels when not holding a paddle or an oar. I clipped my whistle onto the front pocket leash, and attached my rescue knife to the front lash tab. Before long, just seeing my Ninja was like a high five to my brain. 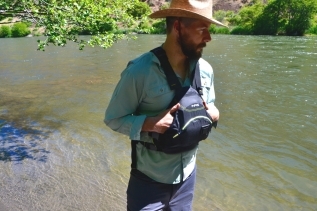 It’s strange how a piece of gear becomes a part of you, but after wearing the Ninja enough times I began to identify it with river fun. I wrote my name and phone number with a Sharpie beneath the Ninja printed on the back to let the world know it was mine. When I’d return home cold and wet but happy to the bone, I’d regal Rachel with stories from the day. I’d tell her about the wildlife I saw, explain in detail the rapids I ran, and say how I can’t wait until it warmed up and she’d join me. I also said I thought she’d really enjoy her Ninja PFD. Spring came but the weather hardly changed. It felt like the PNW was stuck in a perpetual cycle of cold rain. Then one magical day in May I checked the forecast and saw that the weekend called for hot sun in central Oregon. Rachel and I cleared our calendars and planned a two-day, 42-mile trip down the lower Deschutes, and I got the new, NRS Ninja for the trip. My plan was to test which Ninja I liked best and keep the winner for myself. I’d toss the old PFD that smelled like mold in the trash, and use the second-choice Ninja as my raft’s backup. 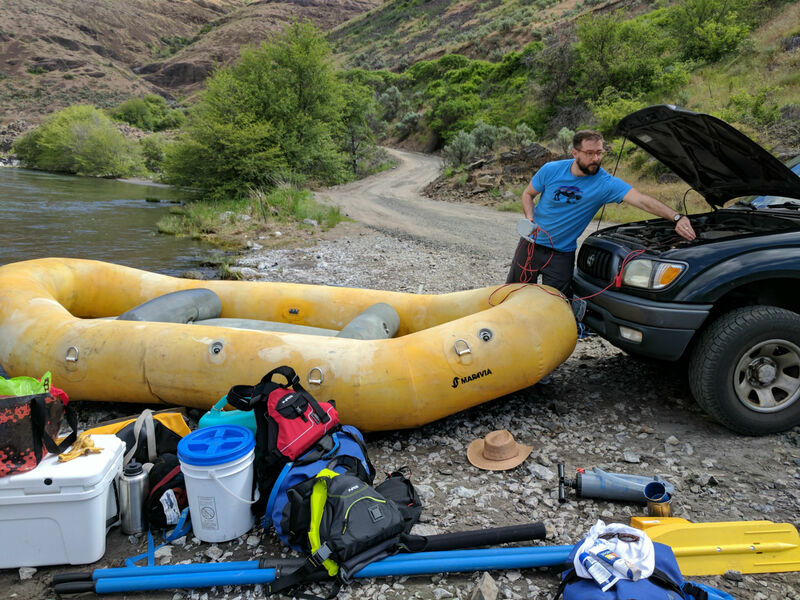 When we arrived at the Deschutes, we piled all the gear from my truck onto the gravel ramp. Other groups began descending upon the put-in to rig up, and it was then that I realized Rachel and I were now the whitewater couple that wears matching life jackets. At least hers is red and mine is black. After a few miles on the oars, I decided the Ninja II feels just like the original. 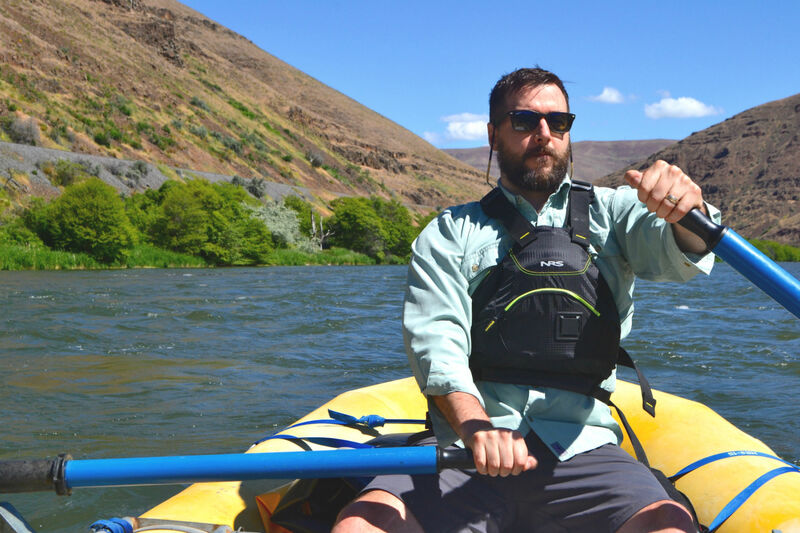 It’s the shoulder mobility that makes the PFD stand out. The floatation panels are essentially two triangles that float between your sternum and your waist. So your entire upper body is free when you paddle. No matter how much the current jukes your arms, neither Ninja will ever interfere with your stroke. I already liked the Ninja II, but I could tell the real difference with Rachel. The difference between the two Ninjas is in the details. 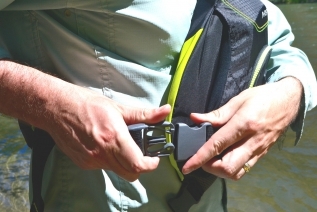 The Ninja II has a larger chest pocket that can fit a phone in a waterproof case. The front pocket on the old Ninja couldn’t, but it does have a leash within the pocket where I attached my whistle, and I wish the new one still did. The Ninja II also has a slightly more comfortable waistband buckle; the strap is encased in fabric, and rubs less against your skin. Both have oversized buckles for a side entry that makes on/off a snap. Literally. 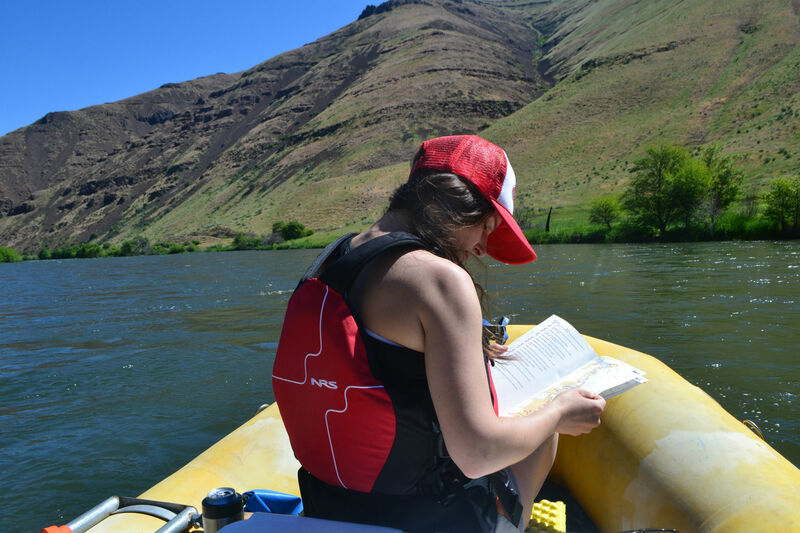 Whatever modifications the designers had made were lost on us now as we floated down the Deschutes. Rapids came and rapids went, but soon the hot sun demanded we go for a swim. It had been months since I last swam, and that was when I flipped my raft on a swollen Cascade stream, so it didn’t really count as relaxing. We rowed into an eddy and caught the slack water by the bank. We tied the raft to an exposed root and I got ready to swim. The sun was hot and the water was cold and when I eased myself into the current the electric water felt like a big “NO.” But I believe that small doses of intentional pain prevent you from becoming a total wuss, so I floated out and lost sensation. The Ninja II kept me afloat when my arms and legs froze, and once I emerged from my cold water stupor it kept me warm as I bathed in sunlight like a cold-blooded lizard. That night we established camp at a no name spot along the Deschutes. We hung the Ninjas from a tree and pitched the tent. Then I realized we needed pillows and so I grabbed our PFDs from the branch. 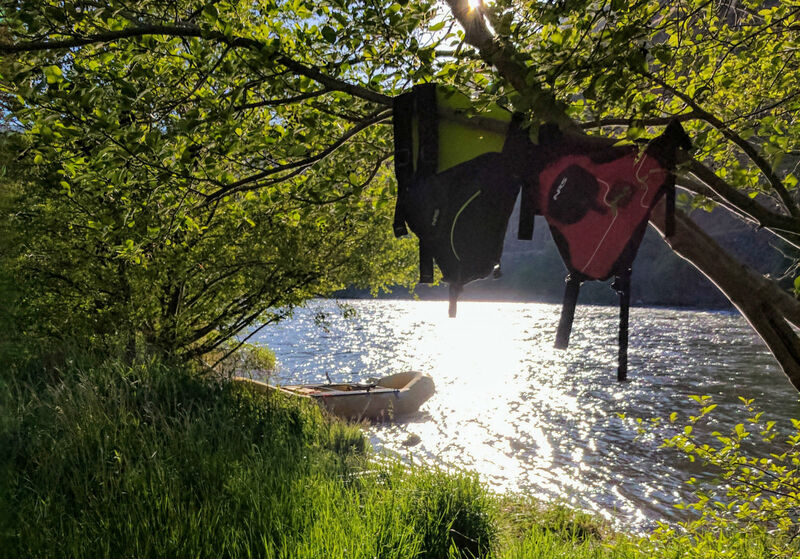 I know it’s a little forward to sleep with your PFD on the first trip, but we slid them beneath our heads and drifted off while looking up at the stars. Editor’s Note: Photos courtesy of Rachel Lahoff.